What is Canvas? Why use it in Seat Covers? From sailing the high seas to painting a portrait canvas has a wide range of uses. But what is it? And why would I want my seat covers made from it? The most basic definition is a ‘closely woven, heavy cloth of cotton, hemp, or linen, used especially for tents, sails, etc’. ‘thefreedictionary’ More widely the fabric is used in marquees, backpacks, tarps, fashion objects like handbags, shoes, luggage, computer carry bags, trailer covers and seat covers to name a few. The word canvas is derived from the 13th century Anglo-French canevaz and the Old French canevas. Both may be derivatives of the Vulgar Latin cannapaceus for “made of hemp,” originating from the Greek κάνναβις (cannabis). Wikipedia. Modern canvas is usually made of cotton or linen and can have polyester added to form a poly-cotton fabric. It differs from other heavy cotton fabrics as it uses a plain weave rather than twill weave. Canvas comes in two basic types: plain and duck. Plain is a single thread or yarn in both directions weft and warp. The threads in duck canvas are more tightly woven with 2 yarns twisted together in the warp and sometimes in the weft also. Duck canvas is used in applications in which a thick, tough, durable fabric is required. Canvas may be obtained untreated (loomstate) or with flame-retardant treatment, water-resistant treatment, UV treatment or all three. Canvas identification is often based on the finish or treatments it has applied along with its weight. There is an old imperial method of weight identification based on its weight per square yards, it runs from 1 to 12, but the highest three odd numbers are not used, so the numbered duck grades are 1, 2, 3, 4, 5, 6, 8, 10, and 12, growing progressively lighter in weight. All a bit confusing! These days the metric system is a little simpler stating the GSM of the fabric ‘grams per square meter’. This is often converted into ‘ounces per square yard’ too. Just divide your GSM by 33.906. To go the other way multiply ‘ounces per square yard’ by 33.906. What is best for heavy duty Seat Covers? Fabric manufacturers have blended polyester and cotton to produce the perfect combination of strength, durability and feel for the purpose of seat protection. Poly-cotton canvas retains the soft texture of cotton, however, it has the protection characteristics of polyester. 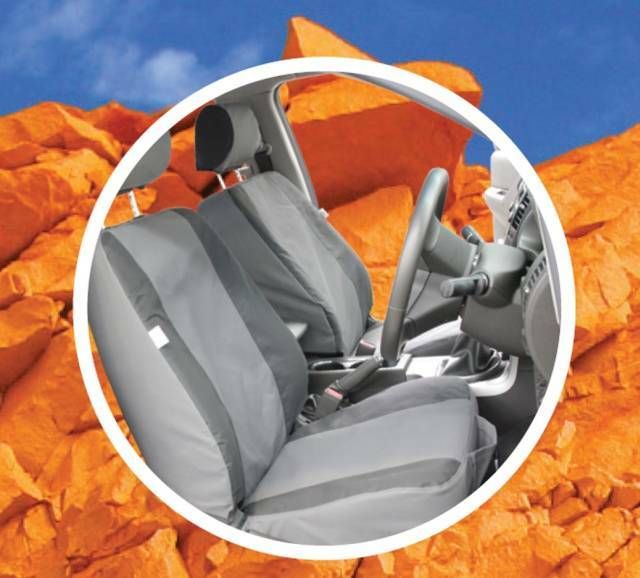 The resulting product is an affordable, attractive and easy-to-clean seat cover that will give maximum protection to your valuable personal or business automotive assets be they used in 4×4 sports driving, industrial or commercial applications. In summary, a good quality duck poly-cotton canvas finished with a UV, water resistant and rot resistant coating, will give you the best high performance protection for your seat. Great feel, strength and tremendous resistance against spilt drinks, food, sand, mud, vomit, whatever is thrown at it by your staff, children or pets. Poly-cotton is machine washable so cleaning is easy and effortless. Always follow the manufactures cleaning instructions as fabric coatings can vary. The Canvas Seat Cover Company can answer your questions and supply all of your canvas seat cover needs. WARP – Lengthwise threads, i.e. they run the length of the roll of woven cloth. WEFT – The transverse, or crosswise, threads woven into the warp threads. WEIGHT – Weight of cloth generally in gsm (gram per square metre) GSM. BIAS – The angle of the warp and weft threads, usually 90º but can be 45º. Canvas Seat Covers offer the best protection for your valuable seats.